To gain some more organisations in our workshops, we are planning to lay out a material / texture / color sample archive. This has to be applied to diverse materials, such as wood, plastics, metals etc. Do you guys have any advice how to start / organise such a archive? Perhaps you have some example images of how you created one yourselves? One step that comes in really handy is cutting your materials to sizes that work with your most common projects. For example, cutting large 4'x8' plywood sheets down to 2'x4' allows material to be stored in a smaller space, and works well for shops that don't often need a whole sheet. And when you do need full sheets it's easier to run out and grab some than have them fill up storage space for months. The laser cutter I work with has a 1'x2' bed space, so we keep all our stock for that (wood, plastic, card stock, etc) cut into 1'x2' pieces and stored in bins that slide in and out of a shelf. For now we separate out the opaque and transparent plastics into different bins, though eventually we would like to sort them by thickness as well. One great tip when you have materials/items stored in bins is to glue/wire a small sample to the front of the bin, so you can get a good idea at a glance what you are dealing with. Another handy tip is storing common materials near/with the tools that use them. Having a good stockpile of material near tools can save a lot of trips/time. 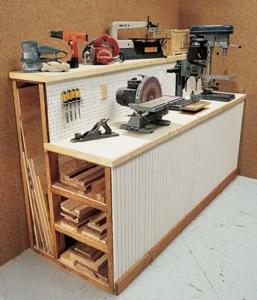 Shop and material organization is something I spend a good deal of time thinking about. I don't have a massive warehouse, so I like to keep things organized to make good use out of the space I do have. I'd love to hear any organization tips/ideas you have! nice workshop that desk there. I'm always struggling to find something more efficient for storage of this and that. I like your design there.